When the wealthy Bon Agornin died, he wanted to be as certain as he could that all five of his children were well taken care of. His eldest daughter had a rich and successful husband, and his eldest son had a good position as a parson. So in his will, he deemed that his inheritance be divided among his three youngest children, all unmarried and with limited prospects for significant advancement. But his rich son-in-law misunderstands and terms of his will and takes part of the inheritance for himself and his family. With bitterness and grief in their hearts, the siblings go their separate ways. Soon, the younger son files a lawsuit in an attempt to win back his and his younger sisters’ rightful inheritance. Meanwhile, the youngest daughters, twins, are making their way into the world of courtship and romance. One of them must fend off the suits of a parson who assumes that a lady always refuses a man she means to accept. And when he steps too far, she fears that she’ll be disgraced forever, and the disgrace becomes more devastating when she meets someone she could love. The other daughter turns her attention to the plight of servants and finds that not everyone of noble birth is pleased with the status quo. There are dinner parties and proposals and confessions galore… one after the other after the other. Is there any way these siblings will find happiness? And will the bad villains be brought to justice? And did I mention that all the characters are dragons? Jo Walton’s Tooth and Claw is basically a Victorian novel with dragons. In her introduction, Walton notes that she owes a lot to Framley Parsonage by Anthony Trollope (which I haven’t read), and I could see bits of Elizabeth Gaskell and the pre-Victorian Jane Austen sneaking around the edges. The social morays are pure 19th-century, except that the downtrodden and the dead literally get eaten by their lords or their heirs, who gain strength from the dragonmeat. (The inheritance dispute, in fact, is centered on who had the right to eat the body of Bon Agornin.) Childbirth is perilous for the female dragons, yet they must bear many children to ensure that there are heirs. And females who are made impure are considered unsuitable mates, even if the impurity is through no fault of their own. Unfortunately, their scales turn color if a male advances, so their disgrace is visible to all, unless measures are taken to render it invisible. By setting this rather traditional Victorian tale in a world of dragons, Walton raises the stakes and shows just how unfair the social system was. And she manages to avoid some of the problems I often have with Victorian pastiche, where the narrator seems all too aware how far we’ve come and mostly considers those backwards Victorians with disdain. Making the character dragons instead of people creates some distance and reduces that sense of chronological superiority that gets on my nerves in historical fiction. 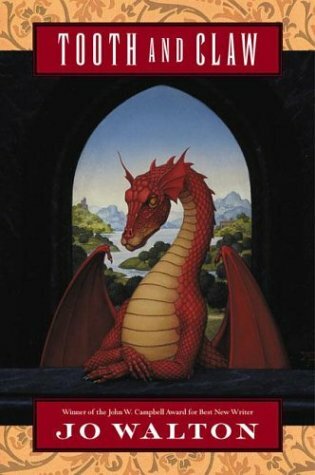 Especially charming is the way Walton gradually reveals the ways the dragon world is different from the human world. The narrator assumes the audience is one of dragons so info-dumps involving basic dragon customs, religion, history won’t work. It must be woven into the story, and Walton does so beautifully. Everything we need to know is revealed as we need to know it. There aren’t a lot of long descriptions of how things work and what the rules are. Yet there’s no lacking in world building. The ways of dragons are not precisely the same as those of humans, but it’s close enough that it never feels totally unfamiliar. At times, in fact, it’s easy to forget this is a book about dragons. But then someone breathes fire—and I mean that literally. I know I’ve seen lots of reviews of this—it’s been on my TBR list for years. But it was the relatively recent reviews by Aarti and Lisa that got me to move it up on the pile. I was fully absorbed in it, rooting for the characters to end up exactly where they were supposed to be. (This is the kind of story that begs for a shiny, happy ending.) My absorption did let up long enough for me to put the book down and laugh for a good long while at a joke toward the end. (It’s in the chapter subheadings.) And the last line is one of my favorites in a good long while—an absolutely perfect ending to a very clever and entertaining book. I was watching your reading progress tweets this afternoon and thinking that you were hooked! :) I am so glad that you enjoyed this as much as I did. I had it off the shelf last night to check something and ended up reading whole chapters over again. I woudl love to read more stories from this world. Once I got time to spend with it, I was fully hooked. And I agree that more stories from this world would be fun! I’m so glad you enjoyed this one, too. I think I tend to gush about it. It’s definitely worthy of some gushing. I’ve been wanting to read this for a while. Because honestly – Victorian dragons is about as cool a sell as you can get. I agree. The premise is just about impossible to resist. I love Walton’s ‘Farthing’ books but have just tried to read her recent ‘Among Others’ and not been able to get on with it at all. This isn’t because I don’t ‘do’ fantasy, I am a great fan, but somehow I couldn’t connect. However, I’m willing to have another go so if the library has a copy of this I’ll see how I get on. This is the only one of her books I’ve read, so I can’t speak to how it compares, but I do think you’ll enjoy this. It’s such a clever blending of genres. Yay! So glad you read this one. I need to get back on Walton’s Small Change series. I read the first one and enjoyed it but have not gotten any further since then. I think this one was so clever. I love how the societal restrictions were made biological. I loved that part of it too. It was such a great way to show how hard it can be to get around such restrictions.